Garbage: Another environmental claim proven to be hyped | Watts Up With That? 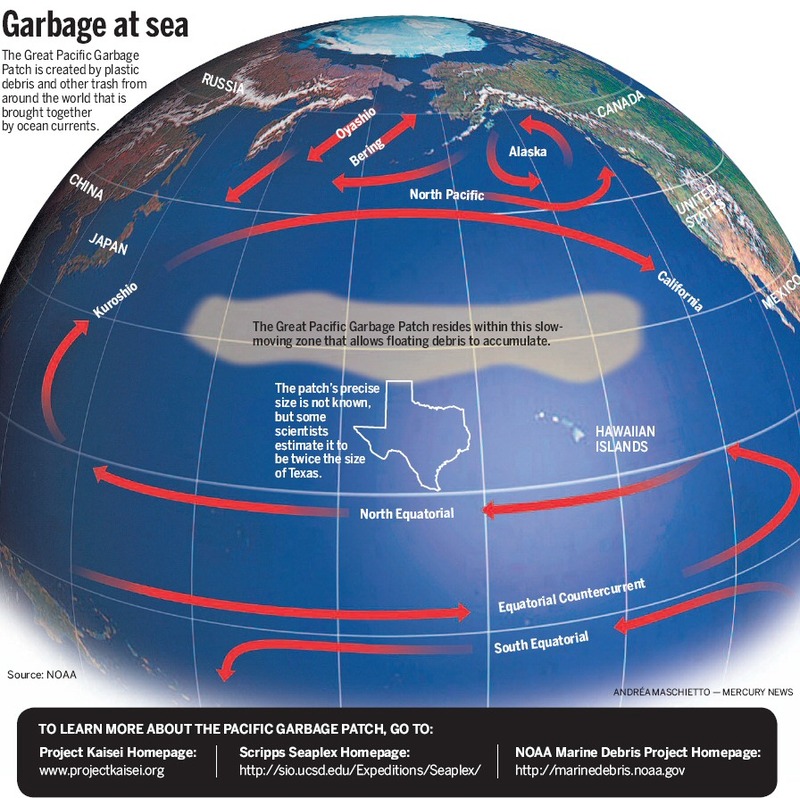 CORVALLIS, Ore. – There is a lot of plastic trash floating in the Pacific Ocean, but claims that the “Great Garbage Patch” between California and Japan is twice the size of Texas are grossly exaggerated, according to an analysis by an Oregon State University scientist. Further claims that the oceans are filled with more plastic than plankton, and that the patch has been growing tenfold each decade since the 1950s are equally misleading, pointed out Angelicque “Angel” White, an assistant professor of oceanography at Oregon State. White has pored over published literature and participated in one of the few expeditions solely aimed at understanding the abundance of plastic debris and the associated impact of plastic on microbial communities. That expedition was part of research funded by the National Science Foundation through C-MORE, the Center for Microbial Oceanography: Research and Education. The hyperbole about plastic patches saturating the media rankles White, who says such exaggeration can drive a wedge between the public and the scientific community. One recent claim that the garbage patch is as deep as the Golden Gate Bridge is tall is completely unfounded, she said. White says there is growing interest in removing plastic from the ocean, but such efforts will be costly, inefficient, and may have unforeseen consequences. It would be difficult, for example, to “corral” and remove plastic particles from ocean waters without inadvertently removing phytoplankton, zooplankton, and small surface-dwelling aquatic creatures. The relationship between microbes and plastic is what drew White and her C-MORE colleagues to their analysis in the first place. During a recent expedition, they discovered that photosynthetic microbes were thriving on many plastic particles, in essence confirming that plastic is prime real estate for certain microbes. White also noted that while plastic may be beneficial to some organisms, it can also be toxic. Specifically, it is well-known that plastic debris can adsorb toxins such as PCB. There are areas of the ocean largely unpolluted by plastic. A recent trawl White conducted in a remote section of water between Easter Island and Chile pulled in no plastic at all. There are other issues with plastic, White said, including the possibility that floating debris may act as a vector for introducing invasive species into sensitive habitats. When this hype was starting, I went and watched all 10-12 youtube videos of a group of students who hopped on a boat from Long Beach, CA and sailed out to this northern gyre. It was painful to watch as about 85% of it was about college kids going stir crazy on a long ocean voyage on a small boat, and about romance between one of the college guys and the only college-age girl to go. The 10 minutes or so of footage of them actually collecting garbage was a series of chopped-up scenes of them dredging the ocean for what appeared to be hours (as the sun position kept changing between cuts) just to pick up a mason jar full of small plastic bits. Now, that is pollution and we should try to eliminate that impact on the ocean if at all possible. But the media portrays this thing as if you can just go out into the pacific and walk on all the plastic, when the reality is you have to work hard to collect a small amount of garbage. The video also provided no proof that what was dredged up was indeed plastic, some of it could have been fairly normal ocean matter. Also, the few scenes they showed under the water while out in this gyre demonstrated that the water was indeed clear and it was impossible to see any evidence of garbage, you weren’t swimming in some fog of trash. Over-hyped is right. It is a shame these people must continue to resort to this tactic, they undermine their entire cause. This really a local aberhation, and no other beaches seem plagued by the same problems. We run rubbish pick-ups and less than a week later you wouldn’t know we had been there. Strange stuff this Plastic – and yes – during the pickup it is evident that much of the plastic is heavily decomposed. I say we build a huge white island of plastic, albedo is nice. by say 1 degree C.
I wholeheartedly agree that any trash in our oceans is too much trash, but more plastic than plankton? Real people believe this nonsense? Now Angel’s response is my kind of science. Thoughtful, measured, and not afraid of standing up against the media hype. Exaggerations do not equal environmentalism? Almost everyone would agree that we need to keep plastics out of the oceans to the maximum extent possible. I’m afraid that this is yet another example of how the pursuit of public funding has corrupted science. These exaggerated claims are designed to get politicians to make more grant money available. It is a form a fraud. These researchers deserve commendation. The recent trends in environmental research have been…”It’s worse than we thought, give us more money so we can study it further.” I thought objective science had gone the way of the dodo, but this is great. I also feel that these researchers make an important point. Just because they are saying that the problem has been exaggerated, doesn’t mean that the problem isn’t real. But is does mean that we should be thoughtful about the solutions. In this case, just doing our best not to pollute is a better alternative then fishing for plastic. Warmists could learn from this type of science. They have tolerated exaggeration (20 m sea level rise in a century) in the name of bringing attention to the perceived problem. Then they propose solutions (like Cap and Tax) in which the cost far outweighs any benefit. Can’t believe all that Garbage came out from Models! The environmentalists have a good track record of inventing and exaggerating a crisis intended to get laws passed favoring their favorite desires. The problem with that is when law makers and judges act on that kind of information. I find it odd that if you do a search on this topic they show some Central American youth in a canoe paddling through trash in some pond and they say it is in the middle of the ocean. Even John Stewart used the image in his book on the Earth. I don’t get it. I know that E = mc^2 and all that, but what the hell does that sentence mean? Omigod, a natural process that collects hydrocarbons for our use? Is there no limit to Gaia’s Cornucopia? The world’s enviromental organizations (Greenpeace, WWF etc) have shown themselves to greatly multiply and exaggerate any threats as a matter of policy. This often seen “ends justify the means” of late has polluted environmentalism and done (hopefully not irreparable) harm to science itself. Worse, science has shown itself willing to participate in hyperbole and outright dishonesty in the name of just cause, too, and it seems to have the perhaps unexpected result that it corrupts the practioner and even the broader practice of science. Cold fusion and a few other famous “findings” are to be found in the past to be sure. However, today, for more than just the few, it is almost okay to lie, cook findings, sell your soul to the devil to get grants and so on. Climate science, wildlife biology, and the virtually moribund social sciences as scientific inquiry are the most fruitful in this exercise these days. But we have had an increase in scientific dishonesty elsewhere these days. Today (no link) it is reported that the link between the usual children’s innoculations and autism found by a UK researcher are a total hoax and has put millions of children at risk – probably because of activist anti-vaccincation leanings. We had the Korean DNA researcher who cooked his results, the Japanese statistic of having the largest pop of centigenarians shown to be hugely inflated …. and I guess the list will keep going on until the goodwill possessed by scientists has been all used up in a good cause. If plastics are a problem then we would see health problems in sea bird colonies, heir young and egg shells and in the bird waste they produce in huge quantities. Plastics do break down, microbes do eat and break down plastics and yet this information is largely hidden. Again and again we see wild exaggerations and inflated claims made only to see those claims fail down the line and when they do fail the publicity is a tiny fraction of the original claims. WWF/FoE/Greenpeace and others made great play on the islands of rubbish, wild claims were made and scaremongering led to bans on plastic bags and restrictions and taxes and campaigns for reusable bags and less packaging. These ‘remedies’ to a non existent/greatly exaggerated problem led to direct consequences. Who can forget the claims of a plastic disaster touted by green groups forcing reactions that led to knee jerk attacks on the plastics industry? So massive changes are enacted by law to address problems that turn out to have little basis in fact, wholesale changes and expensive changes made have no effect and who can forget that the reusable bags forced on people harbour more germs than your average toilet bowl? There is not a problem with plastics in the seas because plastics are largely biodegradable, its a yet another non existent non problem that led to a rush to fix it and that fix caused more problems itself. What in the HECK is this statement suppossed to mean????? Sorry for being a life-long scientist, but these are the kind of rubbery MSM statements that drive me batty. You touched on one of my pet peeves. Like most of us, pollution is a problem and needs to be addressed. However it seems that the hysterical ones want to tie it to a problem that does not exist – AGW. Cleaning up our environment is one cause we can get behind – but not at the cost of impoverishing the entire world. Indeed, the countries that seem to be making the greatest strides in cleaning up the environment, are the ones using the advances of technology to do it – advances that the AGW crowd would roll back in order to fix a problem that is not in evidence. Perhaps shift the subsidies to biofuel to produce corn plastic? The news media environmental claim proven to be hyped! What units of energy and of mass did they use to produce this numerical comparison? or did they somehow use E=mc^2 ? She missed her chance to get more funding by tying her research into the AGW scare. It is obvious the amount of plastic hasn’t increased because the increased CO2 is making the ocean acidic which melts the plastic. Someone needs to get a grant application started on this right away before the AGW money dries up, or freezes. The worst I see when sailing is plastic bottles. They contain air and float. I never could see why people grew up and went back on the bottle. Sorry to be off topic but I just read this and it kinda fits in but on a much larger scale. Almost incredibly, the trigger for what would become a worldwide controversy was a single scientific research paper published in a medical journal – the Lancet – in February 1998. Written by a then-41-year-old laboratory researcher, Dr Andrew Wakefield, and co-authored by a dozen other doctors, it reported on the cases of 12 anonymous children with developmental disorders, who were admitted to a paediatric bowel unit at the Royal Free hospital in Hampstead, north London, between July 1996 and February 1997. Brian Deer the sole investigator who has exposed what I think is the biggest fraud since the Piltdown Man. OT – is it me, or has Morano’s site gone down? It’s called a “meme”. The “meme” of the week is that an area twice the size of Texas is completely fouled with plastic. It doesn’t matter if it’s accurate, or even remotely accurate, or in any way plausible. It’s a meme. Once the meme is out there, it works its way through the brains of people who really should know better and remains there for life. Unless and until the meme is erased or corrected there will now be millions of people with this belief walking around spreading it. Eventually some enterprising souls (possibly the people who started the meme) will come along with a scheme that will clean up the plastic garbage, they just need funding. Donation envelopes appear in the mail, and people who don’t know the difference between research and laundry detergent will send in their cash. To the the phrase “some scientists” on the graphic is a solid demonstration that it’s a load of crap. “Some scientists” also believe the ozone layer is shrinking because of CFCs, the planet is warming from CO2, that DDT thins eggshells, heck, if you look hard enough you’ll find “some scientists” that believe pretty much anything. I personally know a Christian paleontologist who believes the planet is 6000 years old. I wonder though, if they are headed out there to look at the plastic anyhow, and have decided that it should be removed, ( seemed questionable in the article) why don’t they get a bigger boat and drop a net and pick some up ? Then it would be gone in no time. Piers Corbyn is on Alex Jones Infowars now if you are interested. Elizabeth; yes, people who are not well versed in oceanic science and who may have no idea what plankton is will believe something like when a scientist, who IS supposed to be up to speed about things like this, says that there is more plastic than plankton. “There is no doubt that the amount of plastic in the world’s oceans is troubling, but this kind of exaggeration undermines the credibility of scientists,” White said. Hey that’s great news – scientists telling the truth; oh and it’s nice to know the plastic out in the ocean isn’t such a big problem as well. Pollution is bad, as we all know. But let us not forget the lessons we have learned from the antibiotic field. Bacterium and all sorts of microscopic life have the ability to transform their needs and defenses within 1 or 2 generations. Thought expirement, as stated above, these microscopic pieces of plastic are now being colonized by these bateria/phytoplankton. Are they using this as an “anchoring” advantage over the other species that have not adapted said theory? Or have they adapted their nutrient requirements to maybe the use of the hydrocarbons from the plastic itself? Again, gaining unforseen biological advantage over other organisms from another source of high quality energy? When these “rafts” of life are either digested, or become so laden with biological mass that they sink, can we, as humans, then consider this an energy/carbon sink, that heretofore has not been discovered? Could the law of unintended consequences actually be working for the greater good of the biosphere, by our inadvernt disposal of this plastic garbage? And regarding the plastics ability to “soak” up PCB’s and other pollutants. Again, may this actually be advantageous to the biosphere, for as these bits “clean” the ocean waters, could not the colonizing bacterium/algaes be able to develope a system to render these pollutants harmless? We have seen this just recently in the gulf spill, where oil eating bacteria flourished, almost overnight, and, as with Dr. Trenbreth, there were questions about the missing oil, until this biological process was realized. Have we humans, using our monkey sense, maybe unknowingly, actually conspired to help the biosphere, both in cleaning and reducing (of GH gasses)? I have always stood by and will to my dieing breath, that humans are part of nature, and as such, all things we do are “nature-all”. We just aren’t privy to the grand plan. Here’s the thing. Whatever comes out of the environmental movement today, I simply dismiss, or disregard. Which, is actually pretty sad. Fact is, after the fabricated ozone scare of the early 90s (bought hook, line and sinker by this writer, who was a young university student at the time), and the global warming fiasco (which I’m proud to say I’ve NEVER bought into) these people have lost all credibility. Maybe the Garbage-at-Sea, or Ocean Acidification issues really are a problem. But, like in the Chicken Little story, we’ve no basis to trust those promoting these stories. In fact, we have every reason be skeptical the story is real and, if it is real, if it is as bad as being described. I always suspected the size of that great ecological dump was suspect. But as an onlooker I couldn’t know and still can’t. The most alarming reports seem to concern places where confirmation is very difficult. The temperature trends in Antarctica would be an example. Another shocker. They over-hyped the plastic flotilla. How long will we be forced to suffer this practice of pseudologia fantastica? It isn’t as if we don’t know we’re being lied to. We know it. It isn’t like they don’t know we know they’re lying. They know it. And yet day in and day out this over-hyping mythomania persists. How much did this trash finding expedition cost? Who pays simply to disprove what we all knew was a lie to begin with? We do. What’s wrong with these people? What’s the next bs story that will cost fortunes to dispel? Wait, let me guess. The earth is running out of water and we should feel guilt every time with take a shower. Ah good, now I can be proud of my alma mater again – I’ve heard quite a bit of idiocy out of some scientists from OSU. Holy kershmoly, when did they drag Texas out into the middle of the ocean? Couldn’t NOAA just measure it in football-fields instead? Did they find CRU’s and Mann’s hard drives and disks? Awesome, more reason to not care and toss my litter in the street. No problem at all! Just some dumb science hype. Excuse me now, just need to pour some oil down the storm drain. I say give that man a medal! A scientist who is serious about doing science and keeping it credible and not bowing to the political winds? Wow. Better yet give him a budget to design and implement a cleanup program. We could station him in Hawaii just so he could be close to the action (I jest on that part but if he wants a lacky there I’ll volunteer). Thank you Anthony – being pointed to studies like Dr. Angelique White’s is one of the enormous rewards of visiting your site. What a great study! Today (no link) it is reported that the link between the usual children’s innoculations and autism found by a UK researcher are a total hoax and has put millions of children at risk – probably because of activist anti-vaccincation leanings. We had the Korean DNA researcher who cooked his results, the Japanese statistic of having the largest pop of centigenarians shown to be hugely inflated …. and I guess the list will keep going on until the goodwill possessed by scientists has been all used up in a good cause. I heard the current study’s author interviewed on the radio today. Not only did he allow that the author and activists who promoted the vaccine-autism link had ‘blood on their hands’ but he posited that the study that ‘detected’ this linked- based on little more than a dozen pieces of anecdotal evidence – was funded by groups of lawyers hoping to launch class-action lawsuits against the producers of vaccines. That’s about as despicable as the abuse of science can get, but I can see abundant parallels with CAGW alarmist ‘science’. Absolutely makes my blood boil – and I have a son who as full-blown autism. Congratulations to Professor White for calling it as she sees it, and for deprecating the exaggeration by some scientists of the mass extent of plastics pollution. However, the euphoric appreciation expressed in most of the responses here fills me with dread. Almost every serious study which has looked at plastics ingestion by seabirds has shown a disturbing and dangerous increase. Like it or not, it is a serious and well-evidenced problem. One of my main concerns about AGW hype is that it has diverted attention away from more serious – and more evident – environmental problems, such as direct pollution of land, atmosphere and seas. The reaction of people here makes me think that we have already passed the point of no return in terms of credibility. No environmental scientist can publish a warning flag, no matter how well-researched and well-reported, without it being tarred with the same brush as AGW hype. Apparently I’ve also slipped into an east-London twang. My son ‘has’ full blown autism. He’s doing great, by the way. The amount of plastic (1″ in a football field) doesn’t gel with the description of no clear spot in 1000 miles. Re: water, if you are being sarcastic then I didnt get it, sorry. If you were not then you probably dont come from Australia. We have already had various govt. or quasi govt. ads on TV telling us to shower less and change the shower heads. After spending vast amounts of taxpayers money on dams for farming last century the Government in all their wisdom is taking the water back to give to “the environment” and bankrupting farmers on vast slabs on the continent. Goggle something on the Murry Darling Basin Authority (or whatever is their name now). Their current proposal deliberately excluded social/financial costs from their considerations on what to do with water. I believe for water the correct unit is “Olympic Swimming Pools”. And of course there are the Maldives – also known as the ‘Rubbish Isles’ where Over 750,000 tourists a year arrive from the other side of the globe, in aircraft belching CO2. This story and others often spanned by advocacy groups or researchers desperate to keep the grants coming are little more then urban myths. Unfortunately urban myths and science myths all have the same general characteristics. Fortunately many urban myths do not cause harm but science myths can and do and have caused great harm. So I gather that Time is proportional to the Logarithm of the Pacific Plastic; and that the best experimental value for the Plastic Sensitivity, is about 3 years per doubling (almost exackly); somehow I seem to recall that Log (2) is 0.3010600; but maybe I just misremembered, and I don’t know where my seven figure log tables went. But that is almost good enough to use plastic as a clock proxy. In keeping with IPCC protocol and standard Climatism doctrine, I should state that Plastic Sensitivity, is 3.0 +/-50% years per doubling. There that about does it ! The story appeared in the Guardian so a grain of salt will have to go with it. They are hardly a reliable source of enviro-commentary. They don’t know, apparently, that the Maldives are rising, not sinking, for example. It seems from the pictures there is a huge amount of plastic that could be recycled, probably to Dubai. Dubai produces very large amounts of ‘preforms’ which are exported and fed into blow moulding machines closer to market to make bottles. The Maldives have a huge amount of material that could be turned into ocean-proof plastic furniture, docks, boardwalks and so on. Very low tech involved. What a waste of waste. Piers Corbyn on infowars. Well he just lost my respect. How is that near everything gets exaggerated? Did they learn from someone? The same is true with the studies often pointed to when cities decide to ban plastic bags. There just haven’t been any recorded cases of plastic bags killing wildlife on land or in the sea. The plastic debris most often responsible for killing anything is lost fishing gear. And yet we STILL have cities citing a mistaken quotation as justification for plastic bag bans (or surcharges). The people who make these so obviously fantastical claims are the same nut-cases who believe we’re fast running out of landfill space to put our rubbish – and hence must recycle all manner of junk lest we end up turning Gaiya into one big colossal rubbish tip (aka garbage dump). Of course we know that the total area of landfill in the world is a fraction of a per cent, and also that unnecessary recycling is a complete waste of energy, money and manpower – but when did these clowns ever let the truth cloud their judgement? And as for plastic being a “serious and well-evidenced problem” (as Paul_K said) – well, I suppose it’s potentially pretty serious for the bird or fish that unwittingly eats it. But unless someone can show that a few bits (relatively speaking) of plastic floating around the vast seas have any measurable threat to any species, I’m not going to lose any sleep over it. I do, however, lose sleep over what these mindless idiots are doing to the supposedly-free world. The most successful animal species, in terms of biomass, is probably Antarctic krill, Euphausia superba, with a fresh biomass somewhat under 500 million tonnes. Current annual global production is estimated at over 80 million tonnes and is expected to increase by 3 per cent a year. So one type of plankton far exceeds the world’s total plastic production by a factor of 6 times. Even if all the plastic produced by man wound up in the ocean, it still would not match the biomass of the plankton. Also, how much carbon would be produced gathering all this plastic together? There is no pollution just redistribution and recycling of left over wealth. You might joke about it.I think it is sad that we have such a garbage patch in the first place. What does this mean? I know mass and energy are interconvertible by the formula E=mc^2, and I see there is no estimate of the mass of plastic mentioned in the article. But a small amount of matter has enough energy to power a hydrogen bomb, which still only converts a tiny amount of the mass into energy; so I think I am likely correct that if all the plastic in the Pacific Ocean were converted into energy it could cause an explosion sufficient to fracture the planet. Does it really take 250 times that amount of energy to clean up the plastic? If not, what on Earth is this passage really trying to tell us? As PlainJane mentioned, this is already in action! In Sweden, the “green people” have been telling us during several decades, that we shouldn’t waste fresh water, as there are several places around the world lacking the very same. (As we use fresh water for different reasons like toilets, lawns a.s.o.) In other words, they do try to make all others feel guilt about it, but as known: “empty cans make the most noise“. The problem with the “shortage in other places” argument is that the natural water cycle are giving us plenty amount of fresh water, both in Sweden and in Norway. And this this nothing we can do anything about, fortunally … How to solve the “problem” then? Well, exporting fresh water makes no sence, and the “green people” knows this, so they avoid this fact. Get an education and learn how to avoid both economic and political myths! I like this guy. Time for reason and sound decisions based upon TRUTH not hype. And similarly just like in the CAGW scam, their hype used ends up undermining the cause. They ruin it for everyone. By lying, they UNDERMINE their cause, and piss off the others who don’t agree with them…to the effect they will ever ever be taken seriously or believed again. In a similar vein….there is the side of me…as there is a side of most of us (hence my screen name)….that wants to help preserve and protect nature. But Greenpeace’s horrifically radical POLITICAL agenda…undermines their cause at the starting gate. Which makes it completely clear that Greenpeace…which maybe started with good intentions…just ended up like any other totalitarian Orwellian failure of logic and reason. Watch, this professor is going to lose his (her?-I can’t tell w/a french name) job. The last Oregon government employee who failed to toe the party line-the state climatologist based at Oregon State-lost his job because he did not believe in anthropogenic causes of global warming. Professor White’s statements come just as the ‘greenies’ have introduced legislation to make Oregon the first state to ban plastic bags at the retail level. Another instance where media hype does not match the facts. Scientists, you should beware the media attention, because your credibility is undermined when you allow your work to be used by the MSM, and the fanatical environmental ideologues, in nefarious ways. Hey Michael, here’s Alex Jones, if you’re interested. The mass-energy equivalence is E=mc^2 and that isn’t what is being discussed here. Absolutely, just like the low voltage light bulb fiasco which has closed industries and which subsequently has proven to be an environmental and a health danger attached to their disposal, and which takes our quality of lighting for every purpose in life back decades. The people who make these far reaching and injurious laws without serious and unbiased analysis of the often falsified findings of well funded pseudo scientists should be retrospectively made to answer for how they came to their conclusions in the first place. It took all of 10 seconds to find that on Google. There’s another 450,000 search results: have fun. Yes it is sloppy. Lets assume that they mean you would need 250 times the fuel burned to recover the equivalent mass of plastic. This tells us nothing about cost/benefit ratio. The researchers seem to have pushed their study beyond it’s biological assessments. I think the point they are making is that mitigation is more cost effective that reactive control. Where the species are localized such as harbours and reefs then these areas need too be assessed on their own merit. In developed counties we already are coming grips with sewage outlets and I think this could be extended to city runoff. If you can deal with the local conditions this would have a flow on effect too the wider environment. Not much can be done with third world countries or shipping, none the less we need engineering solutions plus education in order to ensure there are no unintended consequences from our utilization of plastic products. Here’s another one, just in case you missed it. Indeed, the energy thing is off-putting. Looks like someone didn’t proof read. I understand though, sometimes when I read what I’ve written it sense doesn’t make. Totally agree. The one that gets me is “plastic bags take 1000 years to decompose in a landfill” or “disposable nappies take 500 years”. So? If it is buried in a landfill – for which we still have heaps of space, who cares how long it takes to break down? Much better a plastic carrier bag buried in a landfill than blowing along the street. Am I missing something viatl here? Apart, that is, from a “vital” spelling checker!!! Or “vital” proof-reading before posting. DOH! Maybe this means that it would take 250 lbs of fuel to remove 1 lb of plactic? I think its sad there are those who exaggerate problems. It distracts us from real issues and feeds the litany of a destroyed world, inducing actions consuming resources needed for the real problems. I’ll call BS, unless you post MORE INFORMATION or links to same! Well, lets see your proof, cause you haven’t shown anything close yet. With respect to landfills and trash disposal, has no one ever pointed out to the enviro’s that a “convenient” land-based landfill (properly managed! and properly protected against drainage issues) is the world’s best place for future re-cycling efforts? All those resources, all those minerals and fibers and metals and elements are already grouped, gathered and refined and placed in one place just waiting until it becomes economically reasonable to mine them again. The only “waste” in garbage disposal is from those (mostly liberal) nitwits in New York and New Jersey who dropped theirs off in a barge to be dumped irrecoverably in the deep ocean for the past century! “They found plastic particles smaller than grains of sand. Dr Thompson’s findings estimate there are 300,000 items of plastic per sq km of sea surface, and 100,000 per sq km of seabed. Now – is this “Dr Thompson” really claiming he found 300,000 plastic items in a square km of sea surface? Should I really believe him? Should I really believe him? Just a random quote from comments. Uh, Angelique is a female name, the researcher is a woman. Many comments referred to her as ‘he’ – including laudatory ones. A reminder of how assumptions without basis are easily incorporated into conventional wisdom, and even science. Six years ago a layman could easily investigate and find the claims to be vastly exaggerated – now there are some early signs of science to follow … finally.